Morehshin Allahyari’s latest work is a hypertext fable hosted on the Whitney Museum of American Art’s artport, its online exhibition portal for new media and net art commissions. The Laughing Snake (2018) blends personal narrative and lore in a black, reflective, 3D-modeled environment. The viewer clicks through the story, weaving poetically forward and back, clicking back over passages to find other results in what amounts to meditation. The effect is something like inhabiting a moral: the fable builds out a space of understanding, its boundaries the moral of the story, while Allahyari’s personal experiences counter the vision of the moral’s intended space. The dissonance within this space and the inversion of the monstrous itself make The Laughing Snake a complex tale of the now that reflects back on us, laughing heartily. Joel Kuennen: The fable of the laughing snake tells the story of a creature with no equal who when held a mirror to, dies of laughter. Your work, The Laughing Snake, is labyrinthian in its form, poetic in its storytelling and shows a mirror back to the audience through direct confrontation of misogyny and power. What do you believe is the import for this tale at this point in history? 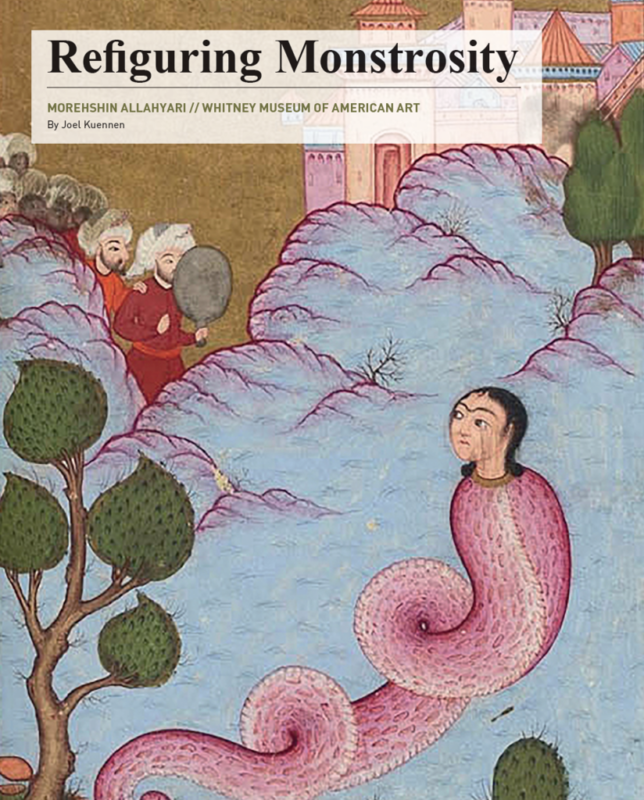 Morehshin Allahyari: I came across the story of “The Laughing Snake and Mirror” from the Book of Felicity and The Book of Wonders.1 The illustration shows a female snake in a beautiful landscape looking at a group of men who are holding a mirror in front of her. As you mentioned, the tale in different Arabic and Persian mythologies is about a snake who had taken over a city, murdering its people and animals. Numerous attempts to kill her remained unsuccessful, and finally the only way to kill her was through holding a mirror in front of her. But unlike the myth of Medusa, who turns into stone when she sees herself in the mirror, “The Laughing Snake” dies from seeing her reflection in the mirror; laughing at it hysterically until she self-destructs. In the tradition of my in-progress work and research (which The Laughing Snake is a part of), I wanted to turn this story around; to embrace the monstrosity; to change this image and the structure. Through writing a new story about The Laughing Snake, I chose to show that she is not laughing at her own reflection, but rather at her reflection within the world she lives in. Her laughing, and subsequent death, is a powerful gesture to take her reflection back—I use that to tell real personal stories about the past and present of my life and an imagined future. Stories about sexual experiences in Iran, the ownership of female body in a patriarchal culture and society, and laughter as the rejection of that history, and a way to reimagine a different kind of world for the women of the Middle East. When the #metoo campaign was at its peak, I felt connected and disconnected to it at the same time. Because I felt like it lacked the voice of women of other cultures and colors. I think the kind of daily trauma and harassment you deal with as a woman in the Middle East is a very specific experience. It does not only come from a patriarchal culture, but also from religious oppression. And it is not just a men towards women kind of oppression/possession, but also traditional, in a religious sense, with women towards other non-religious women. I wanted this to be contextualized in the space where white, Western feminism still takes a majority of space. JK: Regarding this choice of format: the hypertext “choose your own adventure” style of storytelling, what is the significance of this kind of narrative-building? For me, there seems to be a parallel to the kind of story-telling prevalent since the rise of the internet—which is multi-narrativistic, with different experiences at different points in time, all presented on the same platform. MA: I have always been really into open-ended writing. I think for me, one of the most exciting aspects of web art and hypertext narrative has been its potential as a format for playing around with this kind of storytelling and narrative-building. I wanted the narrative to start more as a linear form and as you go through it, things get more and more chaotic and unknown until you spend a good amount of time re-doing some of the paths; choosing other words that take you to other sections, etc. The only way to understand the full narrative, to travel back and forth between past and future and present, is to spend time with the piece. Which I hope people do. JK: The selection titled “Her Equal” leads to a series of stories from your own life relating to cultural limitations on gender and sexual expression. When and how did you come across the story of “The Laughing Snake” and what drew you to it as relevant to your own experience? MA: For me, art making has always been about finding a space between personal and collective. All of my work relates to political and social experiences, but from a personal space. I am inspired by my/our daily struggles and I want my/our voice to be heard. I want these issues to be seen and known. To make the invisible visible and amplify, amplify, amplify. I have a lot of problems with Universal Feminism and I think it has been used for years to amplify the voice of a certain kind of feminism while promoting that this is what is “Universal” or shared. I think many other WOC are working every day and really hard to talk about these issues and how our problems have been forgotten or silenced consciously and unconsciously over many years. The story of “The Laughing Snake” is about the female image and reflection. It is about death and laughter. It is about winning and losing. I wanted to take all these concepts and relate them to my personal experiences. As you mention, when you choose the “Her Equal” option, you can experience a series of personal experiences about going to school in Iran, about being verbally and sexually harassed, about having a body that is constantly controlled and censored and taken over, about my sexual experiences and desires. If you come from a cultural background similar or close to mine, you know that talking about some of these issues in our communities and societies is still a huge taboo. So, I was very nervous about sharing these stories, while I was also determined that it matters do so. The more we talk about these experiences the more we carve a path, a space that has to accept and embrace us and towards a future that is made by us for us. JK: What is the imperative to keep old myths alive and what do you find valuable as an artist in this activity? MA: She Who Sees The Unknown is a body of work of mine in which I research dark goddesses, monstrous and jinn female figures of Middle-Eastern origin to create new narratives about them through several practices including storytelling, 3D modeling, 3D printing, archiving, performance and a series of events. It is not so much about wanting to keep old myths alive, but instead about wanting to create worlds around these figures who are forgotten and misrepresented through 1500+ years of history. I have been working on this body of work for almost two years, and I think what I love the most and care about the most is this practice of Refiguration; as a form of art activism, a feminist and poetic exercise. When I come across a story or a figure that I like, I conduct a lot of research on it to understand other interpretations of it in other cultures, and then I work on that one figure/story for about four to five months to build an archive around it, to write a new visual, text-based story around it, and also put together different talks and panels focusing on that very specific figure. I think going back and reimagining these figures, and reappropriating them, allows for the proposal of another kind of future—a future not taken over by patriarchal and colonial systems and forces. The majority of superhero/powerful role models of the world are male. They are the ones to look up to, to want to be like. And in my research, sometimes I find different interpretations of some of these monstrous figures, Huma, for example, originally was queer or genderless, but through years of oral and written narration, these jinn have become more male. Being ‘powerful’ and ‘influential’ is connected to a system that cannot see women as positive monstrous figures that people can look up to and appreciate. When I rewrite these stories, I return to that queer/female figure that these myths were originally imagined as, or could have potentially been, if we did not live in a patriarchal world. To me, that is the power of this work. To remind women, femmes, and the people of the Middle East that the figures within our stories (both fictional and actual) matter—not just for the present, but for claiming an alternative future. For reimagining a new kind of Middle East and world with a female, noncis, non-white, non-Western future. I think with all the madness happening in the world right now where we just feel torn between multiple fascist governments (the Iranian government vs Trump for example), with the travel ban and a new kind of “rejection” of our bodies in the West, we need more and more of these kinds of counter narratives, imaginations, and platforms. Morehshin Allahyari is an artist, activist, educator, and occasional curator. She was born and raised in Iran and moved to the United States in 2007. Allahyari has been a part of in numerous international exhibitions at the Venice Biennale di Archittectura, Pompidou Center, Museum of Contemporary Art Montreal, Tate Modern, Queens Museum, Pori Museum, Powerhouse Museum, Dallas Museum of Art, Jeu de Paume, Contemporary Arts Museum of Houston, and the Museum für Angewandte Kunst. She has been an artist in residence at BANFF Centre (2013), Carnegie Mellon University’s STUDIO for Creative Inquiry (2015), Autodesk Pier9 Workshop in San Francisco (2015), and the Vilém Flusser Residency Program for Artistic Research in association with Transmediale, Berlin (2016), and Eyebeam’s one-year Research Residency (2016–2017) in New York. Her work has been featured in The New York Times, Huffington Post, Wired, National Public Radio, Parkett Art Magazine, Frieze, Rhizome, Hyperallergic, and Al Jazeera, among others. She was recently awarded two major commissions by Rhizome, as well as the Whitney Museum of Art, Liverpool Biennale, and FACT to work on developing archival and web-based aspects of this project. September 26, 2018 | Filed under Art Seen: International and tagged with Joel Kuennen, Morehshin Allahyari, Whitney Museum.